I’ve mentioned on occasion that I was homeless for a period of time. However, don’t think I’ve shared my experience. It’s time I change that. When I became homeless is a little hazy. It was during the period after I became sober, yet, hadn’t been diagnosed with depression or bipolar disorder. That was a six month gap so I would guestimate I was homeless for two or three months of my life. My head was spinning out of control and I was an absolute disaster. I do know I had run out of places to stay. All my “friends” were just barfly’s so, for most of them, there was no deep personal connection. A few of them did let me stay awhile, but they always insisted that I understood it was only a temporary solution. With each one it became apparent pretty quickly that I wasn’t looking for a job, so each stay didn’t last long. I was doing the best I could with what I had, but it wasn’t enough. After frying my brain for years, before getting sober, I was out of control and I truly believed that posting an application on Monster.com was serious job hunting. After all, I checked every day to see if I got responses. It wasn’t my fault there were no companies who saw what a tremendous asset I was. One after another I abused my stay over privileges until it became just me and my jumbo duffle bag with nowhere to go. I spent a lot of times in Alcoholics Anonymous meetings because I knew, at least, I’d get some coffee, cookies and maybe a little inspiration. Possibly even a sliver of hope. I spent most of my time in Hollywood or West Hollywood because I knew where they had daytime meetings, which can be hard to find. In both communities, I knew where the best bushes were for stowing my bag so that I could wander around aimlessly. One funny aspect is, despite being homeless, I had a therapist. Before I got sober I was in a relationship that was very violent and the L.A. Gay and Lesbian Center was the only center in the country that offered a domestic violence program for those who are LGBT. The clinic charged on a sliding scale so my cost for therapy was only $1 per week. There were weeks I was unable to pay. Finding a place to sleep was never difficult. Most of the time I slept on the #4 city bus. I specifically chose that bus, not only because it ran 24 hours, but because it ran a relatively long 18 mile route. All passengers are required to exit at each end and are then required to pay fare to go back the other way. 18 miles is a long way on a bus so it provided a good amount of rest before it was time to get off for the reverse trip to the other end. I became bus savvy pretty quickly. On one end of the #4 line is Santa Monica and it was not uncommon to be stuck there when I ran out of bus fare. There are far worse places to be stranded and I found myself spending quite a bit of time there. 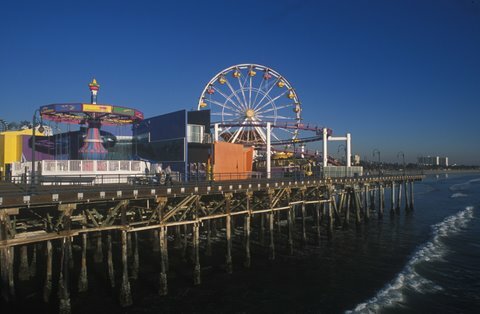 The police had no patience for those sleeping in doorways or in parks at night, but they left me alone when I would sleep on the famous Santa Monica Pier. Kind of strange when I think about it. I found through trial and error that the most comfortable, and least cold, bench was the one closest to the Ferris Wheel. During the daytime sleeping in the parks is permitted, so I frequently would enjoy long naps there. I’ve shared my daily activities and where I slept each night, but there’s plenty more to tell, including how I fed myself. Watch out for tomorrows article for the rest of my story about being homeless. ‘Those were the days my friend I thought it would never end’ – part of a song but I know what you mean in this post. Looking back it must have been a very rough time and maybe every now and again, it’s good that you had a memory lapse (reply to Umashankar) because the thoughts might just bring you back to a place you don’t want to be. Despite what has happened, you have an experience to share with many others, who you may stop from coming to harm. Enjoy the rest of this lovely weekend mate. Hi RPD! Good to see you again. Of course it was extremely hard then, but today I Iook back and see this as an experience. How many people can say that in one life they laid on a sailboat drinking mimosa’s and slept on park benches. It still hurts, but I survived. It’s woeful and scary to learn about your unfortunate days and nights. Perhaps it is cruel to ask but how did you feed and wash yourself? May the Force be with you! It’s not cruel at all. I do bring it up in the next days post. I have no idea how I ate regularly. I have so much memory lapse that I can’t remember at all. As for my clothing, my duffle bag was huge and pretty much provided me with a full wardrobe so I could go awhile without washing, but again I don’t remember where. My clothes stayed clean and I never looked like a stereotyped homeless man, but for the life of me I can’t tell you how. Wow. I’m glad you shared your experience with us. Very eye-opening and honest. I’m glad you made it through your ordeal. I truly don’t know how to reply to this. I stare at the keyboard trying to think up a reply… I would assume being homeless in California is ‘better’ than Chicago because the weather is ‘milder'(?) Chicago had a recent brutal winter which is horribly tough on the homeless. I agree that being homeless in Chicago would be much worse, however, it does get colder in LA than people think it does. Thank you for your comment. I like doing these in series, Rose, partially because it does bring them back. The other reason is I find it extremely difficult to read long blog posts over a thousand words. My brain still can’t handle it. I figure others might have the same problem so I try to keep the number of words down. Tomorrows post will be a little longer than normal. I believe. I look forward to reading more…. Welcome Sharon! I’m glad I got your interest. It amazes me that you speak so candidly about it. It would be interesting to read more of your story. Brad, how did you get money to eat? Did you have to ask passers by for it, and if so are there generous people out there? Lora, how I ate is somewhat of a mystery, but I’ll cover that more tomorrow. I never panhandled. The only time I almost did was when I was stuck in Oakland and the only way into San Francisco was via car or train. There’s a mystery as to how I got to Oakland in the first place. Someday I hope to be able to piece it all together.